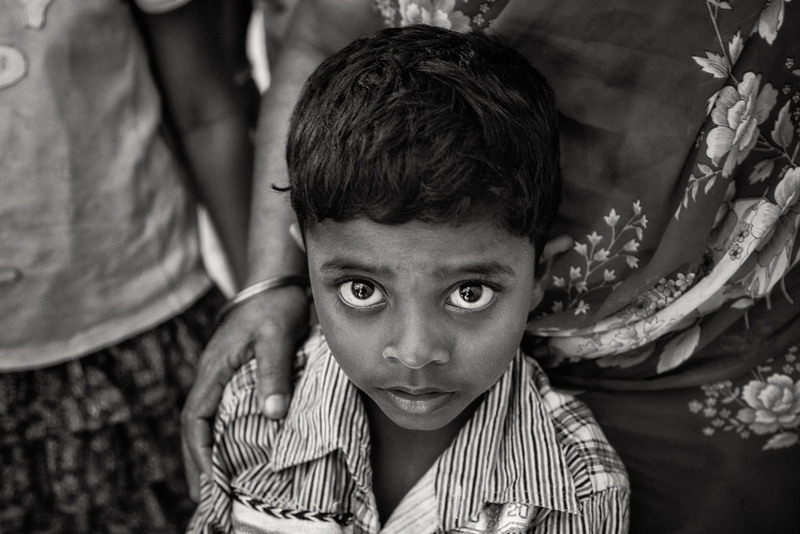 A highly emotive portrait of a young boy on St. Thomas Mount near Chennai, India. There is an often-uttered phrase in photo circles that states “you should never photograph down on your subject”. 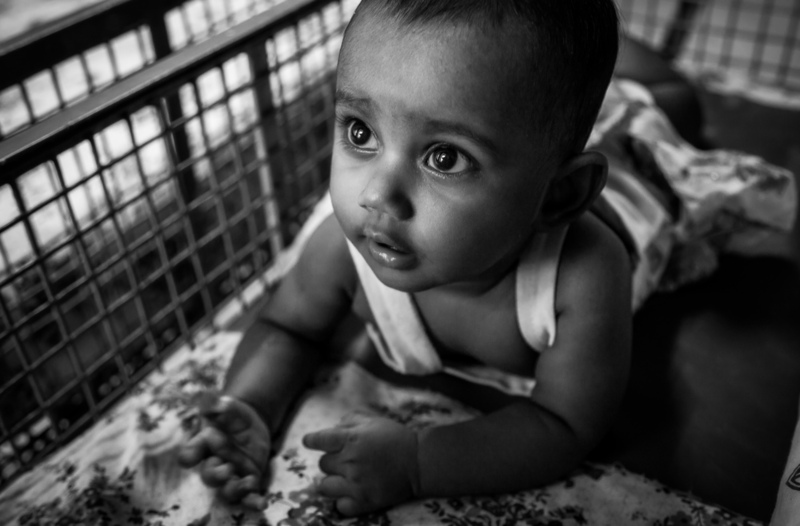 The phrase relates, primarily, to portrait photography of young children. The implication is that, by pointing the camera downwards you are effectively looking down on your subject, both literally and metaphorically. As a result you can demean your subject by portraying them as inferior, vulnerable or powerless. Just to be clear, it’s perfectly reasonable to photograph from a slightly elevated position to help illuminate the eyes and/or to explore notions of cutest or adorability in the child. That’s a perfectly legitimate approach. What I’m talking about is photographing from a more extreme point of view. We all have memories from when we were small children. There’s no doubt that big adults could look imposing, particularly when we had to look up at them. As a consequence we felt less powerful and, at times, somewhat vulnerable. And that’s particularly true when a finger was being wagged in front of us. Of course no photo is the same and the same approach can deliver a very different result with different subjects. For example, the downward gaze has traditionally been employed when photographing women as a way of emphasizing their sexuality. Does the term come hither help make my point? Likewise children and animals can look incredible cute when photographed from above. What approach is best depends upon the message or story you want to explore and the meaning that is derived from it. My own approach is to work in a collaborative manner to produce positive, life affirming images. It is important to me that the subject experiences both joy and a sense of empowerment through the process of having their photo made. The concept of not photographing down on children is, for the most part, fine and good. But, as is often the case, there are both technical and emotive exceptions to the rule. Making portraits under clear, bright skies presents numerous difficulties. Light hitting the subject from above doesn’t reach the eyes, recessed into the skull like caves. As a consequence the eyes will photograph overly dark as light fails to reach them. There are several ways to get light into the eyes, thereby reducing contrast and bringing the eyes back to life. One way is to use fill flash, another is to employ a diffuser to decrease the light’s intensity and produce a softer quality of light on the face. You might then ask the subject to sit or bob down and then to lift their head up towards the camera and, thereby, the overhead light source. By lifting their head towards the light the eyes will be illuminated, and by employing a diffuser the intensity of the sun will often be reduced enough to prevent them from squinting. If you don’t want the hassle of having to carry a diffuser, or to have to organise someone to hold it in position while you make your photo, simply ask your subject to move into what’s called open shade. All you have to do is to position your subject inside an area of even shade, usually just one or two steps out of the bright sunlight. Being out of direct sunlight your subject will no longer squint, their eyes will be revealed and their face illuminated with a more diffuse and, thereby, more flattering light. Don’t forget this tip. It’s gold! Black and white portrait of a man visiting the Kali temple in Chennai, India. 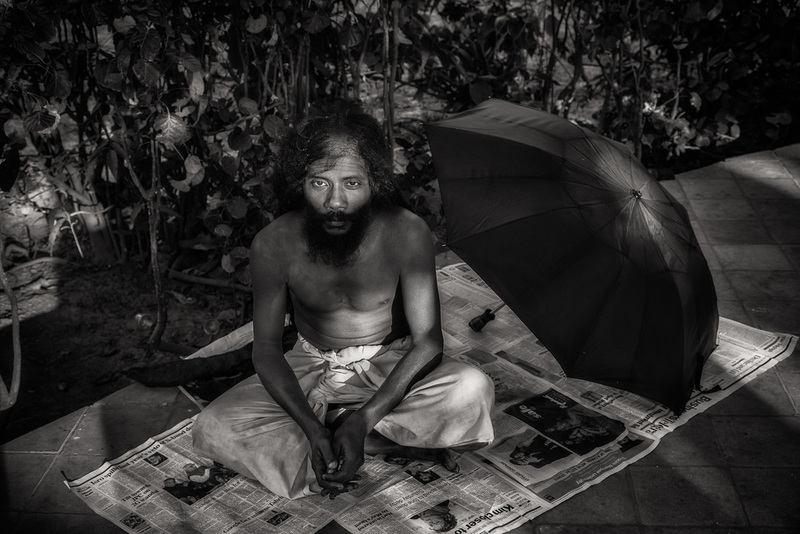 Some of us who have had the privilege to travel have photographed what, by the economic models defined by rich and often western societies, are poor and underprivileged people. Of course the lives of these folks may be far closer to nature and richer in culture and spirituality than our own. These facts require respect, as do those we photograph. What motivates you to photograph them? What message or truth are you trying to communicate? What is the outcome you’re looking to achieve? 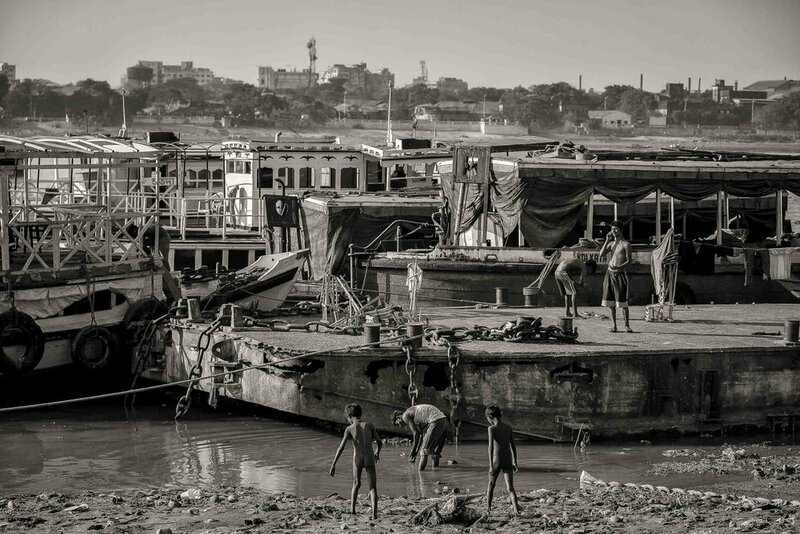 Young boys and workers by the banks of the Hooghly River in Kolkata, India. Let’s imagine you’ve been commission to photograph the plight of those adversely affected by the ravages of war, hunger or severe drought and that the outcome is to raise money to alleviate their situation. In this case there’s probably nothing wrong with shooting down as a way to emphasize the vulnerability of the subject and, by implication, a people. I think the same is, sometimes, true when photographing the working poor. In saying that most of my people based images are made at or around eye height. I think that’s because I prefer to make portraits in a way that promotes the notion of equality between subject, photographer and viewer. While your approach will vary with each situation the trick is to find a balance between projecting despair while maintaining the dignity of your subject. Therein lies the duty of the compassionate photographer. The power of photography is not only in what is portrayed, but what is suggested. Meaning and metaphor are essential elements by which the photographic artist can explore truth. Steve McCurry’s photo of the Afghan Girl is one of the most powerful and recognized photographs ever made. It is an iconic image that speaks to us of the resilience of a people, despite seemingly overwhelming oppression. To my mind the Afghan Girl is one of the great photographs. 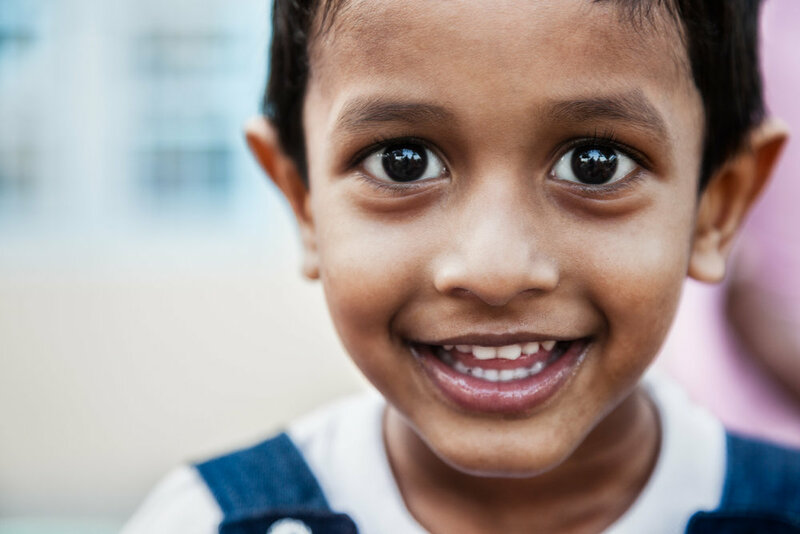 An expression of interest is alive in the eyes of this young boy on the outskirts of Chennai in Tamil Nadu, India. Vulnerability, despair, helplessness and loneliness are all emotions that painters, writers and musicians consider worthy of attention. To more fully explore the Human Condition it’s important that we pay attention to all aspects of life. Please don’t let any misguided sense of political correctness cause you to turn a blind eye to the hardships and suffering experienced by others, whether at home or abroad. As always it is the intent and context behind the images you make that is important. As long as notions of joy, empathy and compassion remain central to the process of making photos, then your outcome is pure and should be pursued with energy and enthusiasm.